The concentration of greenhouse gases in the atmosphere has increased rapidly due to anthropogenic activities, resulting in a significant increase of the earth’s temperature and causing global warming. These effects are quantified using an indicator such as global warming potential, expressed in units of carbon dioxide equivalent (CO2eq), to indicate the carbon footprint of a region. Carbon footprint is thus a measure of the impact of human activities on the environment in terms of the amount of greenhouse gases produced. 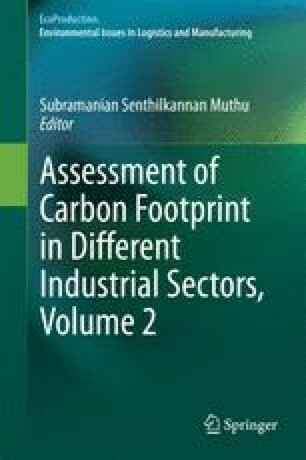 This chapter focuses on calculating the amount of three important greenhouses gases—carbon dioxide (CO2), methane (CH4), and nitrous oxide (N2O)—and thereby determining the carbon footprint of the major cities in India. National greenhouse gas inventories are used for the calculation of greenhouse gas emissions. Country-specific emission factors are used where all the emission factors are available. Default emission factors from Intergovernmental Panel on Climate Change guidelines are used when there are no country-specific emission factors. Emission of each greenhouse gas is estimated by multiplying fuel consumption by the corresponding emission factor. To calculate total emissions of a gas from all its source categories, emissions are summed over all source categories. The current study estimates greenhouse gas emissions (in terms of CO2 equivalent) in major Indian cities and explores the linkages with the population and gross domestic product (GDP). Carbon dioxide equivalent emissions from Delhi, Greater Mumbai, Kolkata, Chennai, Greater Bangalore, Hyderabad, and Ahmedabad were found to be 38633.2, 22783.08, 14812.10, 22090.55, 19796.5, 13734.59, and 9124.45 Gg CO2eq, respectively. The major sector-wise contributors to the total emissions in Delhi, Greater Mumbai, Kolkata, Chennai, Greater Bangalore, Hyderabad, and Ahmedabad are the transportation sector (32, 17.4, 13.3, 19.5, 43.5, 56.86 and 25 %, respectively), the domestic sector (30.26, 37.2, 42.78, 39, 21.6, 17.05 and 27.9 %, respectively), and the industrial sector (7.9, 7.9, 17.66, 20.25, 12.31, 11.38 and 22.41 %, respectively). Chennai emits 4.79 tons of CO2 equivalent emissions per capita, the highest among all the cities, followed by Kolkata, which emits 3.29 tons of CO2 equivalent emissions per capita. Chennai also emits the highest CO2 equivalent emissions per GDP (2.55 tons CO2 eq/lakh Rs. ), followed by Greater Bangalore, which emits 2.18 tons CO2 eq/lakh Rs.